WHAT DOES TRICHROMATIC STUDIO DO? WHY WORK WITH TRICHROMATIC STUDIO? Elevate your product- Trichromatic Studio offers Color, Material + Finish product design services across a range of industries and continents. Our CMF Design services have the ability to make your product irresistible. Trichromatic Studio provides proven Color, Material + Finish Design expertise for products across a range of industries and continents. We offer customized trend research and CMF design strategies to refine and elevate the aesthetics and performance of your product, creating a crucial and compelling emotional impact. Trichromatic Studio CMF Design services can help create a strong emotional connection with your consumer, increase your product's performance, and help your product to stand out from its competition. Create a strong emotional connection with your consumer. Increase your product's performance, aesthetic appeal, and functionality. Help a product to stand out from its competition. Raise the perceived value of your product. Reach a new consumer, market or geography. Create excitement for your product launch and promotion. Provide a compelling sensory experience. Create a system of tiered product positioning. Refresh or reposition your current product without changing tooling or manufacturing processes. Trichromatic Studio designers are masters in trend research and CMF design. With more than 25 years of combined experience, we bring award winning expertise to companies big and small. Whether you are designing new concepts or products, planning to enter a new consumer market or geography, or redefining or repositioning a current product, we have the expertise to help you achieve your goals. With more than 25 years combined design experience working with a range of industries, we bring award winning expertise to companies big and small. Whether you are developing future concepts, designing a new product, redefining or repositioning a product, or planning to enter a new market or geography, we have the expertise to help you achieve your goals. At Trichromatic Studio, we know color. From our expert consideration of hue, value and saturation, to the psychological effects on your target market, we can design the perfect color or color combination for your product. We have a great passion for material design, and specialize in developing materials that problem solve. Let our team use our expert knowledge of textiles, leather, plastics, wood, composites and metals to design materials that will improve your product's performance, functionality, and visual appeal. We obsess over details of every surface on a product- from the gloss level, to the texture and finish. We ensure that the end result will not only make an impact, but create a lasting emotional connection, too. We love making products irresistible. Meet the CMF Design team at Trichromatic Studio, and connect with us today! Kristen Keenan, Bhavna Mistry, and Kylie Lockwood. With more than twelve years of Color, Material + Finish Design experience, Kristen has excelled in the automotive, consumer electronics and footwear design industries. Kristen speaks with equal enthusiasm when discussing her impact on the exterior and interior of a Ford Shelby GT 500 Mustang, the finishes on a Ford F-150 Raptor, or the material design in performance footwear like the Nike LeBron 12. Kristen served on the Nike Trend Council and holds a Bronze International Design Excellence Award for her work on the Kobe 9 Elite shoe in the area of sports, leisure and recreation. Keenan's role in bringing projects like these to light, and her sharp, trained eye for trend research, fueled an interest in taking her practice of CMF Design across multiple industries and into her own hands. An established expert in trend research and Color, Material + Finish Design, Kristen opened Trichromatic Studio in 2016. Kristen earned a bachelor's degree in Fine Arts from the University of Michigan, and continued her studies in Fashion Design at the Fashion Institute of Technology in New York City before kicking off her design career at Ford Motor Company. Kristen has lived, worked and studied across two countries, in places like New York City, Toronto, Detroit, and Portland, Oregon. An eternal optimist with an admittedly dark sense of humor, Kristen loves music, obsessing over design and traveling. A passionate creative, and an expert at identifying and understanding global trends, Bhavna's source of inspiration comes from the colors and patterns that surround us all. Bhavna started her Color, Material + Finish Design career at Ford Motor Company, where amongst other projects, she worked on the Taurus, the brand's flagship vehicle. Afterward, in the United Kingdom, she helped design and establish the colour palette for Q, Aston Martin's bespoke luxury brand. This experience led her to branch out to the airline industry working at JPA Design in London. Prior to beginning a career in Color, Material + Finish Design, Bhavna was a set designer in advertising, and served as an assistant sculptor for Arzan Khambatta, a renowned artist in Mumbai, India. 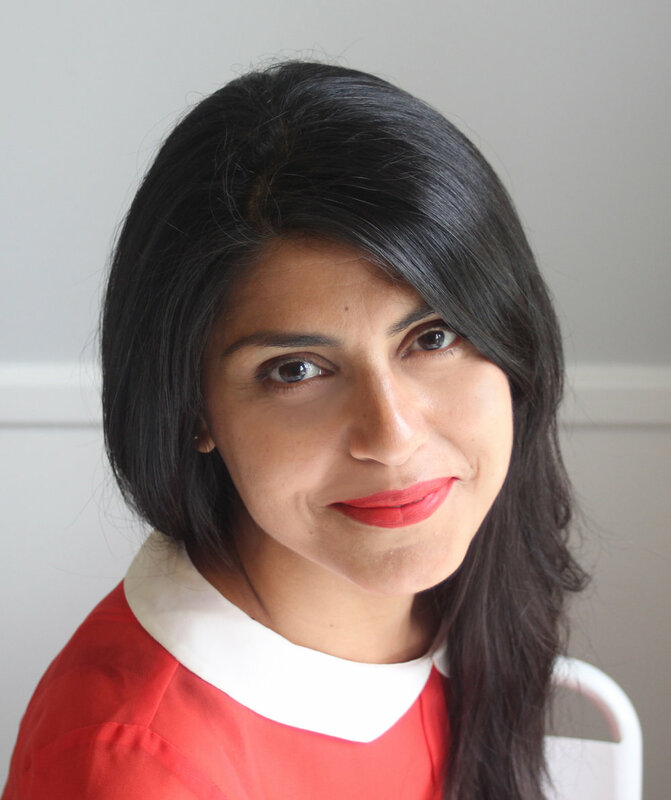 Bhavna earned her bachelor's degree in Interior Design from PV Polytechnic School in Mumbai, India, and later studied photography in North America. Bhavna is inspired by relentless positivity, creativity and a can-do attitude. When she is not designing, she enjoys yoga, reading, traveling and collecting mid-century modern furniture. She has lived in India, New Zealand, Germany, the United Kingdom and the United States, and currently resides in Ann Arbor, Michigan. Kylie comes to Trichromatic Studio with a wealth of knowledge based in materiality and a deep understanding of how to communicate through color, form, surface and tactility. She approaches her work with a true passion for the end product, always thinking about how someone will engage with the object, always considering how material, form, and color might be used to draw a potential user in, thus creating a lasting relationship and strong impact. Kylie's first foray into the design industry was working at Ford Motor Company in Dearborn, Michigan, as a Color & Materials Designer. Most recently, she completed a high profile sculpture collaboration with the Department of Cognitive Neuroscience at the University of Oregon. "I have learned a lot from the peers I've collaborated with over the years" she said. "Seeing how different individuals approach problem solving, whether they're artists, scientists, designers or engineers has been invaluable. I have really appreciated working with a design team where the process evolves through dialogue and collaboration." Kylie earned a bachelor's degree in fine arts from the College for Creative Studies in Detroit, Michigan and a master of fine arts degree in sculpture from Hunter College in New York City. Kylie currently lives in Detroit, Michigan, and is a member of CAVE, a studio and exhibition space that supports artist led projects in the Russell Industrial Center. Kylie is an avid reader who is currently trying to grow a green thumb. She loves any opportunity to spend a significant time in water.